Copyright © 2015, 2016, 2017 XBRL International Inc., All Rights Reserved. This document specifies semantics and syntax constraints for tables. Tables reference subsets of the facts and fact related information defined by a DTS, and specify representation of those facts in a Cartesian coordinate system. This document specifies semantics and syntax constraints for tables. Tables reference subsets of the facts and fact related information defined by a DTS, and specify representation of those facts in a Cartesian coordinate system. A table defines a virtual space which represents an arrangement of facts. Applications may display facts from an existing instance according to this arrangement, or allow entry of new facts according to this arrangement. All tables defined by this specification can be used for rendering existing instances, and some may be used for the addition or modification of facts to form new instances. This specification does not constrain the details of how these facts are presented or entered. This specification defines the semantics of the table linkbase. It also describes a syntax that is used to represent these semantics. Tables use hierarchies to specify the arrangement of XBRL facts. These hierarchies are one of the basic building blocks of the specification, but also constitute by themselves a vehicle to communicate the meaning of those reporting concepts in a similar fashion to that of the presentation linkbase, but enhanced to cover multidimensional information and more complex models. This specification defines the semantics of tables (and the syntax to define them). It does NOT define how tables should be rendered or formatted. References to specific formatting decisions are provided for explanation purposes only, and tools are free to produce any rendering that honours the logical structure of the table(s). Such XPath expressions allowed by this specification are evaluated with no context item to avoid the use of arbitrary XPath expressions which rely heavily on the XML of the instance. Data entry is the use of this specification for the purpose of entering new facts or editing existing facts in a (possibly new) instance document. Uses that fall outside these definitions are also acceptable. A fact source is a container for XBRL facts. For example, a fact source may be an existing XBRL instance or may consist of new facts created (possibly on-demand) from information entered by the user. The fact source consists of facts that are to be considered for inclusion in the table. The facts actually included in a table are those facts in the fact source that are in the domain of the table. A fact source need not have a serialisation. It MAY exist only in memory, or be dynamically created on demand. A fact source MAY be modifiable. The structural model represents the structure of each table, independent of the way it was defined and any details pertaining only to the way it will be rendered. It captures the meaning of the tables. Tables are grouped into table sets. The shape of each table is described in terms of hierarchical breakdowns of fact space. A table consists of one or more independent breakdowns of the fact space. Together, these constrain the facts to be included in the table and describe their arrangement in the layout table. The set of participating aspects for a table is the union of the participating aspects of each of the table's breakdowns. The domain of a table is the restricted fact space defined by the combination of constraints from all of the table's breakdowns, along with any additional global constraints specified using table filters. The domain of a table determines which facts are eligible for inclusion in the table. The shape of the table is the particular arrangement of constraints into the breakdown trees for the table. Tables may have a fixed shape, independent of the facts in the fact source. Alternatively, regions of a table may have shapes that vary depending on the facts in the fact source. Any axis without any breakdowns has a single slice (e.g. a row or column) along that axis, which contributes no constraints. For example, a table with a single breakdown on the x-axis and no breakdowns on the y-axis will have one row, and a table with a single breakdown on the y-axis and no breakdowns on the x-axis will have one column. A table set is a set of one or more tables that share a common definition, parameterised by table parameters. A single table definition is parameterised by its table parameters and produces a single table set that contains a sequence of tables. A table set corresponds to an ordered Cartesian product of the sequences obtained by evaluating the global parameters associated with the table definition's parameters. Each item in the ordered Cartesian product represents a set of bindings which bind each table parameter to a single value from the sequence obtained by evaluating the corresponding global parameter. Each of these sets of bindings corresponds to a table. The ordering of this Cartesian product is derived from the order of the table-parameter relationships and the order of the global parameter evaluated sequences. The Cartesian product is ordered first according to the order of the first sequence then by each of the subsequent sequences in turn. A table definition model resolves to a sequence of tables in a single table set in the structural model. The tables in a table set vary according to the values assigned to the table parameters. A table parameter is a named parameter which binds to an item of the sequence obtained by evaluating a global parameter. A table parameter is specified by a parameter declaration that is linked to a table through a table-parameter relationship. For a given table in the structural model, each table parameter binds to an item in the sequence resulting from the evaluation of the global parameter. The value of the table parameter is assigned to a named variable. These variables may be referenced anywhere that the table linkbase syntax allows an XPath expression. Table parameters allow multiple related tables to be produced from a single table definition, forming a table set. A table-parameter-relationship MUST have a table:table resource on its "from" side. Error code xbrlte:tableParameterSourceError MUST be reported if the processing software encounters a table-parameter relationship that does not have a <table:table> resource on its "from" side. A table-parameter-relationship MUST have a parameter declaration on its "to" side. Error code xbrlte:tableParameterTargetError MUST be reported if the processing software encounters a table-parameter relationship that does not have a parameter declaration on its "to" side. The @name attribute on a table-parameter relationship defines the QName of a variable bound to the value of the table parameter for the current table. Within the scope of a single table in a table set, XPath variable references with this QName evaluate to the value of the table parameter for that table. If this QName is the same as the QName given in the parameter declaration, XPath variable references with this QName are references to the variable containing the individual parameter value, which overrides the parameter reference. The value of the @name attribute on a table-parameter relationship MUST be unique within the scope of a single table. Error code xbrlte:tableParameterNameClash MUST be reported if the processing software encounters a table-parameter relationship with a value for the @name attribute which is the same as the value of the @name attribute on any other table-parameter relationship for the same table. A breakdown is modelled as an ordered tree of structural nodes. Each of these nodes contributes zero or more constraints to the breakdown. These constraints are grouped into one or more constraint sets, which may each be associated with a tag. There may be at most one constraint set without a tag for a given node. Each type of node in this specification defines the constraint set(s) it contributes. A node which does not explicitly define any constraint sets is deemed to have a single empty constraint set. Different constraint sets for the same node MUST NOT have the same tag. Error code xbrlte:duplicateTag MUST be reported if the processing software encounters a tag which is used on more than one constraint set for the same node. It should be noted that the rules enforced by xbrlte:missingAspectValue apply within constraint sets for the same node as well as across different nodes in a breakdown. Each node may have a number of tag selectors which specify the tags to be selected when determining the combined constraints for a cell as described in Section 7.6. Each leaf node corresponds to a row (or column) in the table and each path through the breakdown tree from root to leaf determines the constraints to be satisfied by facts in the corresponding row (or column). Figure 2illustrates a simple table, in which sales figures (y-axis) are broken down by two dimensions: Product and Geography (x-axis). Figure 3 shows (part of) the corresponding structural model (the constraints associated with each node are not shown). All leaf nodes in a breakdown are at the same level in the tree. A path from the root node to any leaf node will therefore have the same length. A tree that has this property is referred to as a uniform depth tree. The process of height-balancing ensures that every breakdown consists of a uniform depth tree of nodes. A constraint is a restriction on the facts eligible for inclusion in a table cell, in terms of their aspect values. A fact satisfies a constraint if the aspect value specified by the constraint is equal to the value of the same aspect for the fact. Facts must satisfy all of the combined constraints of the intersecting rows and columns to be rendered or entered in a cell according to the rules laid out in Section 7.6. Each constraint may be tagged to indicate that it only applies in combination with the corresponding tag selector. The aspect values associated with closed definition nodes can be determined during the resolution process. The aspect values associated with open definition nodes cannot be determined until expansion occurs as part of the layout process. Two QNames are QName equal if and only if their namespace URIs are equal and their local parts are equal. Two aspect values are aspect value equal if they are values for the same aspect and are also equal according to the rules specified for that aspect. Two aspect values for the concept aspect are equal if the QNames of the concepts they identify are QName equal. Two aspect values for the period aspect are equal if the period values are equal as defined in XBRL 2.1. Two aspect values for the unit aspect are equal if the unit values are equal as defined in XBRL 2.1. Two aspect values for the entity identifier aspect are equal if the entity identifier values are equal as defined in XBRL 2.1. Two aspect values for the same explicit dimension aspect are equal if the the QNames of the members they identify are equal. Two aspect values for the same typed dimension aspect are equal if they have corresponding typed dimension values. Note that custom typed-dimension aspect tests are not used by this specification. Two aspect values for the non-XDT segment aspect are equal if the xfi:nodes-correspond XPath function would deem them to be. The aspect value for the non-XDT segment aspect is the (potentially empty) ordered sequence of child elements of the segment element which do not report values for XBRL dimensions. The analogous equivalence and definition hold for the non-XDT scenario aspect. The participating aspects of a breakdown are the participating aspects of the structural nodes in the breakdown. The aspects participating in a breakdown can always be determined during the resolution process, which does not require an instance. The aspect model of the table is the dimensional aspect model . A table MUST NOT contain more than one breakdown that addresses the same aspect. Error code xbrlte:aspectClashBetweenBreakdowns MUST be reported if the processing software encounters two or more breakdowns in a table that address the same aspect. For the unit aspect, the absence of a reported value for the unit aspect is inferred. For other non-dimensional aspects, the absence of such a constraint is an error. Error code xbrlte:missingAspectValue MUST be reported if the processing software encounters a leaf node in a breakdown which does not specify or inherit a value for any non-dimensional aspect which participates elsewhere in that breakdown. Breakdowns are combined by taking the Cartesian product of the individual lists of constraints. Every breakdown is associated with one of the axes defined by the layout model. Several breakdowns may be projected onto a single axis in the layout table, as described in Section 9.3.2. Interactive tools MAY provide a mechanism to allow the user to pivot the table by moving breakdowns between axes and re-ordering breakdowns on the same axis. A closed breakdown is defined as a breakdown whose sequence of constraint sets can be determined independently of the facts to be included. A closed breakdown cannot directly depend on an instance. However, a closed breakdown may depend on parameters. An application can always provide values for these parameters to satisfy this dependency. The expression for the default value for such a parameter may refer to the content of the instance document, and an application can evaluate this expression against the fact source if it is an instance document. An open breakdown is defined as a breakdown whose sequence of constraint sets changes dynamically with the facts included and thus cannot be completely determined without knowledge of those facts. An example of an open breakdown is one that breaks down facts by period. For presentation of existing data, this requires a slice (e.g. row or column) for each period against which a fact is reported. For data entry, it requires the ability to dynamically create and populate new slices as the user enters data. A structural node may contribute no constraints, in which case it exists solely to group together its children (possibly contributing a header to the table axes; see Section 5.5.4). A closed structural node has been fully resolved during resolution, and is not further expanded during layout. An open structural node is a structural node that does not fully define aspect value constraints and does not necessarily have a one-to-one relationship with layout nodes produced during resolution. During resolution, an open structural node is expanded to a number of layout nodes. The ordering of layout nodes produced during this expansion is implementation-defined. An open structural node semantically represents a set of values for a given aspect. For example, an open structural node may represent "all periods used in the fact source". For data presentation, the contexts are required in order to enumerate the periods which will ultimately determine the number of slices (e.g. rows or columns). For data entry, the open node acts as a placeholder for the periods period entered into the application. The application MAY expand this placeholder according to the values already entered and MAY display a placeholder directly, possibly using it to accept new data. A closed structural node may be associated with one or more labels, as described in Section 6.5.2, for the purpose of labelling the header cells it contributes to the layout table. Every header cell corresponding to a given structural node shares the same labels. Open structural nodes do not have labels. The labelling of header cells is described in Section 7.4. 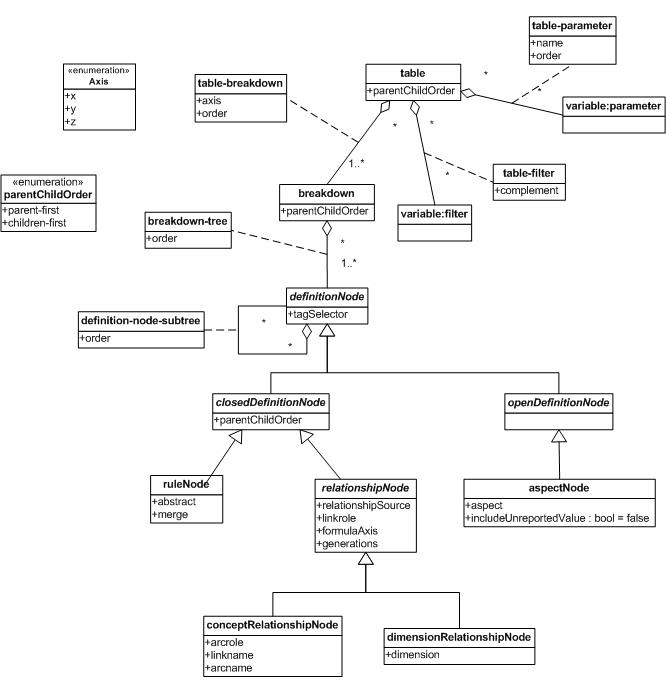 For any node which has no labels, processors are free to choose labels corresponding to that node's constraints. For a node with a single concept or explicit dimensional member that has not been inferred according to Section 5.4.7, processors SHOULD use one or more labels associated with the concept in the DTS. Processors SHOULD NOT add labels for any constraints inferred according to Section 5.4.7. Any labels which are not explicitly attached to a definition node, which are attached to a structural node by a processor MUST be indicated as coming from the processor. In the layout model serialisation, the "processor" value for the @source attribute is used. The path label of a given resource role for a leaf node in a breakdown is the sequence of node labels of that same resource role associated with the nodes in the path from the root of the breakdown to the leaf. The slice label of a given resource role for a slice (e.g. a row or column) is the sequence formed from the concatenation of the path labels of that same resource role for the slice. The path labels for a slice are the path labels of the leaf node which aligns with the slice, in each of the breakdowns on the axis. The order of the concatenation is the order defined by the breakdowns by the table linkbase. If an application allows breakdowns to be reordered within an axis or pivoted between axes, it MUST use the original order and axis when determining slice labels. The cell label of a given resource role for a cell is a map from each axis to the slice label of that same resource role for the slice which aligns with the cell on that axis. Error code xbrlte:tableMissingConceptAspect MUST be reported if the processing software encounters a table in which the concept aspect does not participate. The absence of any other aspect has no effect on the structural model. See also Section 9.3.1. A table linkbase MUST consist of one or more valid generic links. Violations of this requirement MUST be detected by validation against the Generic Links Specification [GENERIC LINKS] and the XBRL Specification [XBRL 2.1]. The <table:table> element is related to breakdown definitions which define the shape of the table. It can also be related to filters which restrict the domain of the table. The @parentChildOrder attribute on a table declaration defines the default placement of roll-up nodes contributed by all closed definition nodes in the table for which it is not overridden, as described in Section 6.5.3.1. Tables MAY be associated with generic labels and generic references, as described in Section 6.5.2. These labels apply to every table in a table set. A table-filter-relationship MUST have a table:table resource on its "from" side. Error code xbrlte:tableFilterSourceError MUST be reported if the processing software encounters a table-filter relationship that does not have a <table:table> resource on its "from" side. A table-filter-relationship MUST have a filter on its "to" side. Error code xbrlte:tableFilterTargetError MUST be reported if the processing software encounters a table-filter relationship that does not have a filter on its "to" side. The @complement attribute on a table-filter relationship indicates whether the filter's effect is inverted. The default value is @complement=false. A table-filter where the @complement attribute has a value of true uses the filter complement rather than the filter itself. A breakdown definition is represented by a <table:breakdown> resource. The <table:breakdown> resource is related to trees of definition nodes which define the shape of the breakdown. The @parentChildOrder attribute on a breakdown defines the default placement of roll-up nodes contributed by all closed definition nodes in the breakdown (as described in Section 6.5.3.1) and overrides the value inherited from the table. A table-breakdown-relationship MUST have a table:table resource on its "from" side. Error code xbrlte:tableBreakdownSourceError MUST be reported if the processing software encounters a table-breakdown relationship that does not have a <table:table> resource on its "from" side. A table-breakdown-relationship MUST have a <table:breakdown> resource on its "to" side. Error code xbrlte:tableBreakdownTargetError MUST be reported if the processing software encounters a table-breakdown relationship that does not have a <table:breakdown> resource on its "to" side. Breakdowns MAY be associated with generic labels and generic references, as described in Section 6.5.2. These labels provide an overall description of content of the breakdown. Definition nodes contribute nodes to the structural model through the resolution process (described in Section 9.2). The specific contribution to the structural model depends on the type of definition node, and is described in the corresponding section for a given type of definition node. Definition nodes can include a tag selector using the @tagSelector attribute. Specific types of definition node define overrides for the value of this attribute (for example concept relationship nodes). Except where this value is overriden, all structural nodes defined by a single definition node share this tag selector value. Except as noted in the following sections, elements in the definition model MAY be associated with generic labels or generic references for the purpose of labelling the corresponding parts of the rendered table. Such elements MAY be associated with any number of generic labels and generic references. When more than one label or reference is associated with an element, their order is given by their effective relationships' XLink @order attribute. The relative order of labels MUST be preserved in the structural and layout models. Closed definition nodes define trees of structural nodes. Those which exist to group other closed definition nodes and contain common properties to be contributed to their children. A closed definition node which does not contribute common properties to its children MUST contribute at least one structural node to the table. Error code xbrlte:closedDefinitionNodeZeroCardinality MUST be reported if the processing software encounters a closed definition node which does not contribute common properties to its children and does not contribute at least one structural node to the table. The @parentChildOrder attribute may be specified on a <table:table> element, a <table:breakdown> element, or any element in the <table:closedDefinitionNode> substitution group. The effective value of the @parentChildOrder attribute on a closed definition node is inherited by all children of that node that do not explicitly specify a different value. Closed definition nodes at the root of a breakdown definition inherit the effective value of the @parentChildOrder attribute of the <table:breakdown> element (which may in turn have inherited it from the <table:table> element) as the default value of their @parentChildOrder attribute. A table with one or more open definition nodes defines an open table. A breakdown-tree-relationship MUST have a table:breakdown resource on its "from" side. Error code xbrlte:breakdownTreeSourceError MUST be reported if the processing software encounters a breakdown-tree relationship that does not have a <table:breakdown> resource on its "from" side. A breakdown-tree-relationship MUST have a definition node on its "to" side. Error code xbrlte:breakdownTreeTargetError MUST be reported if the processing software encounters a breakdown-tree relationship that does not have a definition node on its "to" side. A breakdown may be on the "from" side of more than one breakdown-tree relationship. The ordering of the individual breakdown trees is the order of the breakdown-tree relationships, as defined by their order attributes. Where no order attribute is specified on a relationship, or if two relationships have identical order attributes, the relative ordering is implementation-defined. However, it MUST be deterministic. A definition-node-subtree-relationship MUST have a resource derived from the table:definitionNode type on its "from" side. Error code xbrlte:definitionNodeSubtreeSourceError MUST be reported if the processing software encounters a definition-node-subtree relationship that does not have a resource derived from the table:definitionNode type on its "from" side. A definition-node-subtree-relationship MUST have a resource derived from the table:definitionNode type on its "to" side. Error code xbrlte:definitionNodeSubtreeTargetError MUST be reported if the processing software encounters a definition-node-subtree relationship that does not have a resource derived from the table:definitionNode type on its "to" side. 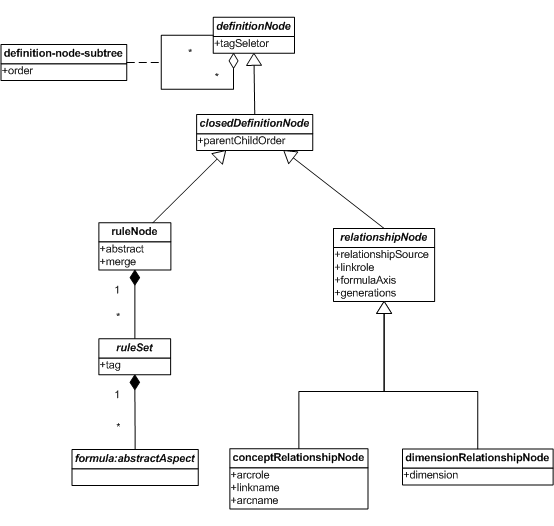 The base set of a definition-node-subtree relationship MAY have undirected cycles but MUST NOT have directed cycles. The children (singular: child) of a definition node P are the targets of definition-node-subtree relationships whose source is the definition node P.
Error code xbrlte:prohibitedDefinitionNodeSubtreeSourceError MUST be reported if the processing software encounters a definition-node-subtree relationship that has a prohibited definition node at its "from" end. A rule node may be merged in which case it contributes no structural nodes, but instead contributes its constraints to its children. A rule node defines zero or more rule sets; sets of aspect rules. Each rule set MAY specify a tag. At most one of these rule sets may omit the tag. Each rule set contributes a constraint set to the corresponding structural node during resolution. If there are no rule sets in the rule node, a single untagged empty constraint set is contributed. The constraints of each constraint set are defined by the formula aspect rules. Error code xbrlte:incompleteAspectRule MUST be reported if the processing software encounters an aspect rule that does not specify an aspect value. Error code xbrlte:unrecognisedAspectRule MUST be reported if the processing software encounters an aspect rule for an aspect which is not part of the dimensional aspect model. Within the scope of a single constraint set, there MUST NOT be more than one aspect rule for the same aspect. Error code xbrlte:multipleValuesForAspect MUST be reported if the processing software encounters a constraint set which has more than one rule for the same aspect. Aspect values that use a QName to identify an item declaration (e.g. a concept or dimension member) in the taxonomy MUST refer to an existing domain member declaration (as defined by the XBRL Dimensions 1.0 specification [DIMENSIONS]: an item declaration that is neither a dimension declaration nor a hypercube declaration). This requirement does not affect other aspect values, such as units, that involve QNames. Error code xbrlte:invalidQNameAspectValue MUST be reported if the processing software encounters an aspect rule whose value does not refer to an existing domain member declaration. A merged rule node indicates additional properties which apply to all of its children. A merged rule node contributes no structural nodes directly, but instead contributes its constraints and its tag selectors to its children (which in turn will contribute structural nodes). A merged rule node MUST NOT have any tagged rule sets. It contributes all of its constraints to every constraint set produced by its children. Error code xbrlte:mergedRuleNodeWithTaggedRuleSet MUST be reported if the processing software encounters a merged rule node with a tagged rule set. A merged rule node MUST be abstract. Note that by virtue of the fact that all abstract nodes must have children, so must merged rule nodes. Error code xbrlte:nonAbstractMergedRuleNode MUST be reported if the processing software encounters a non-abstract merged rule node. The @abstract attribute on a <table:ruleNode> element determines whether the node is abstract or not. This has implications for how it resolves (see Section 6.6.4). The default value is @abstract=false. The @merge attribute on a <table:ruleNode> element determines whether the node is merged or not. This has implications for how it resolves (see Section 6.6.4). The default value is @merge=false. A merged rule node is a rule node that is represented by a <table:ruleNode> element with @merge=true. A <table:ruleNode> element MAY have one or more elements from the <formula:aspectRule> substitution group as children of itself, or as children of <table:ruleSet> elements which are children of itself. These are used to specify aspects and aspect constraints for the node. Each <table:ruleSet> element represents a rule set with the tag specified by the @tag attribute. The children of the <table:ruleSet> element specify constraints in the corresponding constraint set with the same tag value. The rules which are direct children of the ruleNode form the untagged rule set. These rules specify the constraints in the untagged constraint set. If there is at least one tagged rule set, and no aspectRule children of the ruleNode, there is no untagged rule set. If there are no tagged rule sets, and no aspectRule children of the ruleNode, the untagged rule set is empty. A <table:ruleNode> MAY have <formula:aspectRule> elements that have an XPath expression. The context item when evaluating any XPath expression in such an aspect rule is undefined. XPath expressions MAY refer to variables as described in Section 6.9. XPath expressions SHOULD be evaluated when constructing the table, but are not expected to be re-evaluated as data is entered (if used for data entry). Defines a column with three alternative constraints for the period aspect. Each non-merged rule node resolves to either one or two structural nodes, as shown in Figure 7 and Figure 8, respectively. Merged rule nodes do not resolve directly to any structural nodes, but instead contribute their constraints to their children. An abstract rule node MUST have at least one child. Error code xbrlte:abstractRuleNodeNoChildren MUST be reported if the processing software encounters an abstract rule node with no children. Placement of the roll-up node is determined by the effective value of the rule node's @parentChildOrder attribute, as described in Section 6.5.3.1. Figure 8 shows the children-first case. Rule nodes MAY be associated with generic labels and generic references, as described in Section 6.5.2, with the exception of merged rule nodes, which MUST NOT have labels. Error code xbrlte:invalidUseOfLabel MUST be reported if the processing software encounters a merged rule node has one or more labels. During resolution, these labels are associated with the sole resulting structural node (if there is only one) or the parent structural node (if there are two). A processor MAY add labels to the structural nodes contributed during resolution as described in Section 5.5.4. This section specifies the semantics and syntax for relationship nodes. Relationship nodes provide an implementation of closed definition nodes that resolve into a tree of structural nodes, defined by networks of concepts or explicit dimension members in a DTS. A relationship node is a closed definition node expressed in terms of networks of relationships between concepts. Here the term concept has the general meaning defined by the XBRL 2.1 specification [XBRL 2.1], not to be confused with the aspect of the same name. A relationship node defines a tree walk of all or part of one or more networks of concepts. A relationship node resolves to an ordered tree of structural nodes representing its tree walk. Each structural node has a single untagged constraint set that constrains the relevant aspect (the concept aspect in the case of a concept relationship node or an explicit dimension aspect in the case of a dimension relationship node) to a single value. The order of sibling nodes is given by the order of the relationships by which the concepts or dimension members associated with the nodes were discovered. The ordering between a parent node and its children is defined by the relationship node itself, and is determined by the effective value of the @parentChildOrder attribute, as described in Section 6.5.3.1. Each concrete type of relationship node defines its own syntax and its own rules for traversing a tree of relationships. This specification defines two types of relationship node: the concept relationship node ( Section 6.7.4) and the dimension relationship node ( Section 6.7.5). A relationship source identifies a starting concept for the tree walk. All relationship nodes MUST identify at least one relationship source, either by providing syntax for the source to be explicitly specified by the table linkbase author or by defining a default relationship source in case it is not specified. Where more than one relationship source is specified, the order in which they are specified is significant and is reflected in the resulting tree of structural nodes. If a relationship source is duplicated then the same tree walk is performed once for each duplicate source. 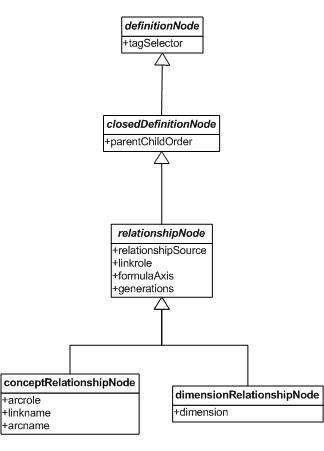 Every relationship node MUST specify the basic parameters of its tree walk, consisting of values for the formulaAxis and generations properties. The formulaAxis property is an enumeration whose allowed values MUST be a subset of the following set: descendant, descendant-or-self, child, child-or-self, sibling, sibling-or-self, sibling-or-descendant, sibling-or-descendant-or-self. These values have the same meanings as the corresponding values of the axis property of concept relation filters [CONCEPT RELATION FILTERS] (with the addition of sibling-or-descendant-or-self value, which behaves like sibling-or-descendant but includes the relationship source and its descendants). The token suffix -or-self specifies that the relationship sources are to be included. If the -or-self suffix is not present, the top level rendered concepts are the children, parent or siblings of the relationship sources. Note that the value of the formulaAxis property only affects which concepts are included in the tree walk. It has no effect on the shape of the resulting tree of structural nodes. For example, the siblings of a relationship source are always treated as siblings, even if they are discovered by walking the network from the relationship source. The generations property is a non-negative integer (xs:nonNegativeInteger) that limits the tree walk to the given number of generations, in the same way as for concept relation filters [CONCEPT RELATION FILTERS]. A value of generations = 0 results in an unlimited tree walk. The relationship sources are not included when calculating the depth of the tree walk, e.g. a value of generations = 1 with formulaAxis = descendant is equivalent to specifying formulaAxis = child. If the value of formulaAxis is child, child-or-self, sibling or sibling-or-self then the value of generations MUST be either 0 or 1. Error code xbrlte:relationshipNodeTooManyGenerations MUST be reported if the processing software encounters a value of formulaAxis that implies a single generation tree walk in combination with a value of generations greater than 1. Relationship nodes offer an alternative way to express some properties; using XPath expressions. The result of evaluating such an XPath expression MUST be castable to the data type of the equivalent non-expression element. Error code xbrlte:expressionNotCastableToRequiredType MUST be raised if an XPath expression is encountered that is not castable to the required type. XPath expressions used to specify the properties of a relationship node have no context item. They may, however, reference table parameters and global parameters defined in the DTS. Relationship nodes MUST NOT have any labels. During resolution, a processor SHOULD add labels as described in Section 7.4. Error code xbrlte:invalidUseOfLabel MUST be reported if the processing software encounters a relationship node which has one or more labels. A concept relationship node is a relationship node which describes a tree of values for the concept aspect in terms of a tree walk of a network of concept-concept relationships. Concept relationship nodes discover concepts by performing a tree walk of an XBRL 2.1 network. The tree walk is uniquely identified by the network and one or more relationship sources. A concept relationship node MUST identify a single network. In most cases, the combination of link role and arcrole is sufficient to unambiguously identify the network, but it may be necessary to specify additional information such as the arc name or the name of the extended link. Error code xbrlte:ambiguousConceptNetwork MUST be reported if the processing software encounters a concept relationship node that provides insufficient information to unambiguously identify a single network. It is not an error for a concept relationship node to specify properties for which there are no matching relationships in the DTS. In this case no relationships are found but the relationship sources themselves are still processed. The participating aspect of a concept relationship node is the concept aspect. As described in Section 6.5.6 concept relationship nodes cannot have subtrees. The syntax of concept relationship nodes is defined by the normative schema supplied with this specification. Error code xbrlte:invalidConceptRelationshipSource MUST be reported if the processing software encounters a relationship source that is neither the QName of a concept that exists in the DTS nor the special value xfi:root. If no relationship source is specified, the special value xfi:root is assumed. The <table:arcrole> or <table:arcroleExpression> element is, respectively, a non-empty URI (xl:nonEmptyURI) or an expression that evaluates to a non-empty URI. In either case this URI identifies the arcrole of the network(s). The <table:linkrole> or <table:linkroleExpression> element is, respectively, a non-empty URI (xl:nonEmptyURI) or an expression that evaluates to a non-empty URI. In either case, this URI identifies the link role of the network(s). If no link role is specified, the standard link role is used. The <table:linkname> or <table:linknameExpression> element is, respectively, a QName (xs:QName) or an XPath expression that evaluates to a QName. It identifies the name of the extended link element defining the network(s). The <table:arcname> or <table:arcnameExpression> element is, respectively, a QName (xs:QName) or an XPath expression that evaluates to a QName. It identifies the name of the arcs comprising the network(s). The <table:linkname> and <table:arcname> elements (and the corresponding expression-based equivalents) are optional and need only be included if necessary to uniquely identify the network. If no relationships are found in the specified network, only the relationship sources are included in the resulting tree. If the resulting tree is empty (for example, because the relationship sources themselves are excluded by the choice of formulaAxis) then this is an error, as described in Section 6.5.3. The <table:formulaAxis> or <table:formulaAxisExpression> element, if present, specifies the value of the formulaAxis property, as defined in Section 6.7.1. If neither element is present, the value descendant-or-self is assumed. 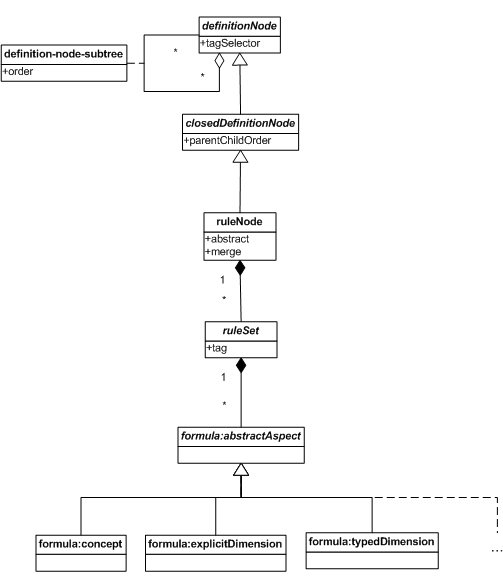 The behaviour of concept relationship nodes with each combination of relationship source and <table:formulaAxis> is described in Table 2 below. when the suffix -or-self is present xfi:root The root relationships are equivalent to a virtual root source concept that has the root concepts of the network as children. when the suffix -or-self is not present xfi:root The root relationships are the relationships whose source is a root concept of the network, causing the children of these root concepts to be the top level of rendered concepts. The <table:generations> or <table:generationsExpression> element is, respectively, a non-negative integer or a non-negative integer expression that, if present, specifies the value of the generations property, which limits the tree walk to the given number of generations, as described in Section 6.7.1. If neither element is present, a value of 0 is assumed. Each concept in the tree walk resolves to at least one structural node, which both constrains the value of the concept aspect to that concept and acts as parent to structural nodes for each of that concept's child concepts. Child structural nodes are ordered by the @order attribute of the relationship linking the child concept to its parent concept. For concepts that are non-abstract and that are not leaves of the tree walk, an additional child roll-up node is added to reserve a position on the axis for facts reported against the concept. No roll-up node is added for abstract concepts or for concepts that have no child concepts. Abstract concepts without any non-abstract descendants SHOULD be skipped. The resulting tree of structural nodes SHOULD NOT contain any leaf nodes with abstract concepts. Because the roots of a network have no incoming relationships (other than the virtual relationships linking them to the <xfi:root> virtual concept), their relative ordering is undefined in [XBRL 2.1]. A concept relationship node may include the root concepts of a network either because a relationship source of <xfi:root> was specified, or because one of the network roots was explicitly specified as a relationship source, along with a value of sibling, sibling-or-self, sibling-or-descendant or sibling-or-descendant-or-self for the formulaAxis property. When resolving a concept relationship node that includes the root concepts of a network, a table linkbase processor MUST order them according to their QNames. QNames are ordered first by namespace then by local name, each using Unicode Codepoint Collation as used by [XPATH AND XQUERY FUNCTIONS]. If a preferred label attribute is present on a relationship, this is used to determine the tag selector value as described below. A preferred label attribute is either a @preferredLabel attribute appearing on a <link:presentationArc> element, or the @gpl:preferredLabel appearing on any arc. Error code xbrlte:ambiguousPreferredLabel MUST be reported if the processing software encounters a <link:presentationArc> during the tree walk which has both the @preferredLabel and @gpl:preferredLabel attributes. If the preferred label attribute value is http://www.xbrl.org/2003/role/periodStartLabel the tag selector value is table.periodStart. If the preferred label attribute value is http://www.xbrl.org/2003/role/periodEndLabel the tag selector value is table.periodEnd. Otherwise, the tag selector value of the concept relationship node itself is used. A dimension relationship node is a relationship node which describes a tree of explicit dimension members in terms of a tree walk of a dimensional relationship set (DRS). The tree walk of a dimension relationship node is uniquely identified by one or more relationship sources. The link role of the outgoing domain-member relationships. dimension relationship nodes traverse the DRS by following consecutive relationships as defined by the XBRL Dimensions 1.0 Specification [DIMENSIONS]. The participating aspect of a dimension relationship node is a single explicit dimension aspect, referred to as the participating dimension. As described in Section 6.5.6 dimension relationship nodes cannot have subtrees. The syntax of dimension relationship nodes is defined by the normative schema supplied with this specification. The participating dimension of a dimension relationship node is specified by a <table:dimension> element which contains a QName (xs:QName). The QName MUST identify an existing dimension declaration in the DTS and the dimension MUST be an explicit dimension. Error code xbrlte:invalidExplicitDimensionQName MUST be reported if the processing software encounters a dimension relationship node that does not refer to an existing dimension declaration or that refers to a dimension declaration that is not an explicit dimension. A dimension relationship node MAY include any number of <table:relationshipSource> or <table:relationshipSourceExpression> elements, each containing, respectively, a QName (xs:QName) or an XPath expression that evaluates to a QName identifying a single relationship source for the tree walk. If a relationship source is specified, it MUST identify an existing domain member declaration. Error code xbrlte:invalidDimensionRelationshipSource MUST be reported if the processing software encounters a relationship source that does not refer to an existing domain member declaration. If no relationship source is specified, the root members of the domain of the participating dimension are used as the relationship sources. Specifically, the relationship sources are the targets of dimension-domain relationships with the specified link role whose source is the participating dimension. Note that the dimension-domain relationships may specify a target role that differs from the specified link role, so that the behaviour is potentially different from the case where the same relationship sources were specified explicitly. See Example 2 for example behaviour. The <table:formulaAxis> or <table:formulaAxisExpression> element, if present, specifies the value of the formulaAxis property, as defined in Section 6.7.1. For dimension relationship nodes, valid values correspond to those for explicit dimension filters [DIMENSION FILTERS]: descendant, descendant-or-self, child or child-or-self. If neither element is present, the value descendant-or-self is assumed. The behaviour of dimension relationship nodes with each combination of relationship source and <table:formulaAxis> is described in Table 3 below. when the suffix -or-self is present omitted The root relationships are the dimension-domain relationships that have the participating dimension as the source. when the suffix -or-self is not present omitted The root relationships are the relationships whose source is the target of a dimension-domain relationship which in turn has the participating dimension as its source, causing the children of these root members to be the top level of rendered members. The <table:generations> or <table:generationsExpression> element is, respectively, a non-negative integer or a non-negative integer expression (xs:nonNegativeInteger) that, if present, specifies the value of the generations property, which limits the tree walk to the given number of generations, as described in Section 6.7.1. If neither element is present, a value of 0 is assumed. The <table:linkrole> or <table:linkroleExpression> element is, respectively, a non-empty URI or an expression (xl:nonEmptyURI) that, if present, constrains the network in which the node should begin traversing the DRS. If no linkrole is specified then the standard link role is assumed. If no relationships are found in the specified network then no error is raised and the resulting tree comprises only the relationship sources. However, if the relationship sources themselves are excluded by the value of the <table:formulaAxis> element then the resolved tree is empty, which is an error, as described in Section 6.5.3. Defines a tree of domain members for the explicit dimension eg:Geography with the eg:World member as the root. Defines a tree of domain members for the explicit dimension eg:Geography with the root(s) of the dimension's domain as the root. Assuming that eg:World is the root of the domain of eg:Geography, the resulting tree is equivalent to the previous example. Defines a tree of domain members for the explicit dimension eg:Geography with a single level consisting of the children of the root(s) of the dimension's domain. In general, each domain member in the tree walk resolves to at least one structural node. This node both constrains the value of the relevant dimension aspect to that member and acts as parent to structural nodes for each of that member's child members. The Dimensions Specification [DIMENSIONS] allows certain members of the domain of an explicit dimension to be marked as unusable. Such members exist solely for the purpose of organising the domain into a hierarchy and are not expected to be used as actual values for the dimension. Processors SHOULD honour the usability of a domain member as defined by the incoming relationship. For usable members that are not leaves of the tree walk, an additional child roll-up node is added to reserve a position on the axis for facts reported with that dimension value. No roll-up node is added for unusable members or for members that are leaves of the tree walk. Unusable members without any usable descendants SHOULD be skipped. The resulting tree of structural nodes SHOULD NOT contain any leaf nodes with unusable members. Relationship sources that are specified explicitly are always treated as usable, as there are no incoming relationships from which to determine the usability. If the relationship source is omitted then the usability of the domain roots is determined from the incoming dimension-domain relationships. An aspect node is an open definition node which directly specifies a single participating aspect, and optionally a restriction on the facts used during expansion to determine the included values for that aspect. An aspect node contributes exactly one untagged constraint set. During the expansion phase of the layout process, an aspect node expands to one layout node for each distinct value of its participating aspect present in its set of contributing facts, plus a single layout node representing the absence of a reported value for the participating aspect if @includeUnreportedValue is true and the contributing facts include at least one fact where no value is reported for the participating aspect. Note that the filters constrain the facts used to determine the aspect values which should be included during expansion, but they do not contribute any constraints to the table. This allows the y-axis to provide constraints for the concept aspect without causing an xbrlte:aspectClashBetweenBreakdowns. Aspect nodes MUST NOT have labels. Error code xbrlte:invalidUseOfLabel MUST be reported if the processing software encounters an aspect node which has one or more labels. During expansion, a processor SHOULD add labels to the layout nodes as described in Section 7.4. 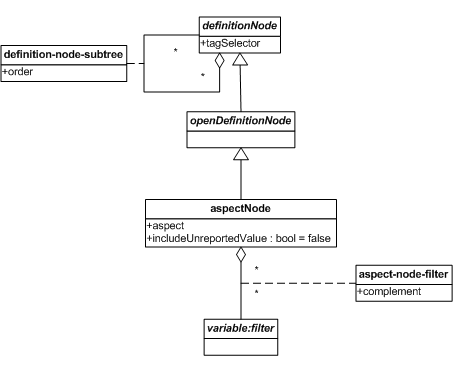 An aspect node is represented by a <table:aspectNode> element with exactly one child element in the <table:aspectSpec> substitution group and optionally one or more <variable:filter> resources related by aspect-node-filter relationships. The <table:dimensionAspect> element specifies a dimensional aspect by the dimension's QName. This MUST be the QName of a dimension that exists in the DTS. It has an optional @includeUnreportedValue attribute (which defaults to false) which specifies the includeUnreportedValue property of the aspect node. Error code xbrlte:invalidDimensionQNameOnAspectNode MUST be reported if the processing software encounters a dimensionAspect element that specifies a QName which is not the QName of a dimension that exists in the DTS. A aspect-node-filter-relationship MUST have a table:aspectNode resource on its "from" side. Error code xbrlte:aspectNodeFilterSourceError MUST be reported if the processing software encounters an aspect-node-filter relationship that does not have a <table:aspectNode> resource on its "from" side. A aspect-node-filter-relationship MUST have a filter on its "to" side. Error code xbrlte:aspectNodeFilterTargetError MUST be reported if the processing software encounters an aspect-node-filter relationship that does not have a filter on its "to" side. A complemented aspect-node-filter relationship is an aspect-node-filter relationship that is expressed by a relationship with a @complement attribute that has a value of true. An aspect node with a complemented aspect-node-filter relationship to a filter uses the filter complement in its implied XPath expression. Global parameters defined anywhere in the DTS. Variables bound to the values of table parameters. A table region is defined by a <table:region> resource with at least one table-region relationship or region-definition-node relationship. A <table:region> without any such relationships has no meaning within the scope of this specification. The region attaches semantics or presentational labelling to the data cells thus identified, and only those cells, not header cells. The region does not automatically select dimensionally-equivalent cells elsewhere. selected by all attached definition nodes, which need not be leaf nodes, as defined in Section 6.10.2. If a region is attached to two definition nodes that have no cells in common, for example two nodes that are siblings, then the region selects no cells. A region will likewise select no cells if it is attached to both a table and a definition node not used in that table. Selections that are too disjoint to be expressed as one region should be expressed as multiple regions. See Section 6.10.3 for illustrations of these rules. Note that projection of breakdowns may make a table region non-contiguous if an attached definition node is used in a breakdown that, after any pivoting/re-ordering, is not first on its axis. The region's resource role identifies the purpose of the region. The following identifies some pre-defined roles and their semantics but others may be used. http://xbrl.org/role/PWD/2017-07-12/disable-cells-1.1 Data entry and display of existing data in the cells of this region MUST be prevented. Implementations that visually mark dimensionally invalid cells as unavailable SHOULD mark these cells in a similar or identical way. If the region has a suitable Generic Label, implementations SHOULD present that label as applying to the region. To apply multiple roles, two region elements selecting the same cells can be written without repetition by giving the regions the same XLink label, such that the relationship arcs apply from both regions. A table-region-relationship MUST have a <table:table> resource on its "from" side. Error code xbrlte:tableRegionSourceError MUST be reported if the processing software encounters a table-region relationship that does not have a <table:table> resource on its "from" side. A table-region-relationship MUST have a <table:region> resource on its "to" side. Error code xbrlte:tableRegionTargetError MUST be reported if the processing software encounters a table-region relationship that does not have a <table:region> resource on its "to" side. A <table:region> resource MUST NOT appear on the "to" side of more than one table-region-relationship. Error code xbrlte:tableRegionDuplicateTargetError MUST be reported if the processing software encounters a <table:region> resource on the "to" side of more than one table-region relationship. A region-definition-node relationship MUST have a <table:region> resource on its "from" side. Error code xbrlte:regionDefinitionNodeSourceError MUST be reported if the processing software encounters a region-definition-node relationship that does not have a <table:region> resource on its "from" side. A region-definition-node relationship MUST have a definition node on its "to" side. Error code xbrlte:regionDefinitionNodeTargetError MUST be reported if the processing software encounters a region-definition-node relationship that does not have a definition node on its "to" side. included (default): all cells aligned with this node are selected, whether aligned with the roll-up or with children. This is the default value. excluded: the roll-up node is excluded; only cells aligned with non-roll-up children are selected. only: only cells aligned with the roll-up node are selected. The following examples show which cells are selected by various combinations of definition nodes and table. In Figure 11, the region consists of a single definition node, which selects the whole of column A. In Figure 12, the region consists of the definition node "A" with a the @rollup attribute set to "excluded", and definition node "C". The former selects columns B1 and B2, but not the roll-up column, C. The latter selects the first row. The cells selected by the region are the two cells that form the intersection of these two. The example in Figure 13 includes definition node "D" which is not present in this table. As a result, the region selects no cells. Figure 14 demonstrates a region that is attached to a specific table. In this case, the region only selects cells which are both selected by the attached definition nodes and which are in the specified table. Figure 15 demonstrates how regions can select nodes on the Z-axis. In this case, two distinct regions are defined, incorporating different nodes from the Z-axis. The process of producing a layout from a structural model is described in Section 9.3. A layout table represents an arrangement of selected XBRL facts following a matrix layout in a Cartesian space with x, y and z axes. Each position along an axis, corresponding to a slice (e.g. a row or column) in the table, is associated with a set of constraints on the fact space. An axis may be composed of multiple independent breakdowns of the fact space. These are combined by projecting them onto the axis, as described in Section 9.3.2. An axis may be associated with several rows (or columns) of headers, indicating multiple sets of nested constraints on the values displayed in the columns (or rows) of the table. Each breakdown contributes a group of rows (or columns) of the header. Each group is associated with the labels associated with the corresponding breakdown. Column (or row) spanning of individual cells SHOULD be used to indicate nesting of constraints, where the output format allows it. Axis headers MAY be simplified when tables are rendered on media not meant primarily for human readability (such as CSV files, which lack a way to span or merge headers). When choosing a single label, the generic label with the standard resource role (http://www.xbrl.org/2008/role/label), if available, SHOULD be used in preference to other labels. Each cell contains the facts (if any) that satisfy all of the constraints associated with the particular row and column at whose intersection they are located, as well as any global constraints associated with the table. The set of constraint-contributing nodes is the set of nodes which align with the cell. The tag selector set for the cell is the union of the tag selectors for each of these nodes. Exactly one constraint set from each of these nodes is chosen. For a given node, if a single constraint set is present which is tagged with any of the tag selectors , it is chosen. For a given node, if multiple constraint sets are present which are tagged with any of the tag selectors, it is an error. Error code xbrlte:tagSelectorClash MUST be reported if the processing software encounters a cell that has aligned nodes with more than one tag selector which match constraint sets of an aligned node for that cell. For a given node with an untagged constraint set, if no constraint sets are present which are tagged with any of the tag selectors, the untagged constraint set is chosen. For a given node without an untagged constraint set, if no constraint sets are present which are tagged with any of the tag selectors, it is an error. Error code xbrlte:noMatchingConstraintSet MUST be reported if the processing software encounters a cell that has an aligned nodes with no matching constraint set. Where different aspect values for the same aspect are present in this set, only the aspect value from the node closest to the leaf is used. The constraints according to the above rules are the combined constraints for the cell. A fact should be included in the cell if and only if all of these combined constraints are satisfied. This specification defines a canonical XML serialisation of the layout model. The syntax is defined by the normative schema supplied with this specification (see A.2). For most of the XML elements in the schema, ordering is significant and corresponds to the order in which the corresponding cells in the table are laid out, as outlined below. The layout model serialisation is used by the conformance suite to compare layouts produced by tools implementing this specification to those expected from a conformant processor. Each table set is represented by a <tablemodel:tableSet> element, as a child of the root <tablemodel:tableModel> element. A serialised layout model may contain any number of table sets. A table set may be optionally associated with a list of labels, which apply to all the tables in the set (these are the labels attached to the original table in the definition model). These are represented by zero or more <tablemodel:label> elements. The order of the labels is given by the relationships linking them to the original table in the definition model. Individual headers for an axis are represented by <tablemodel:header> elements, one header for each one for each row (or column) of header cells for a single axis. These are nested inside a <tablemodel:group> element which contains the header elements based on the breakdown they were contributed by. These group and header elements are ordered starting from the outside of the table (i.e. farthest from the data cells) and working inwards. Each <tablemodel:group> element contains a sequence of zero or more <tablemodel:label> elements corresponding to the labels for the breakdown that group is representing, followed by a sequence of zero or more <tablemodel:header> elements. A <tablemodel:header> element contains a sequence of <tablemodel:cell> elements. Each <tablemodel:cell> element contains a sequence of <tablemodel:label> elements and a sequence of <tablemodel:constraint> elements. Each <tablemodel:constraint> element describes a constraint as an aspect-value pair. Each <tablemodel:label> element describes a label associated with a single header cell. Such labels are ordered according to the natural direction of ordering in the rendered table. Spanning of multiple rows or columns in the table is indicated in the document by an optional @span attribute on the <tablemodel:cell> element. The value of this attribute is a positive integer giving the number of table columns spanned by the header cell. If the attribute is not specified then a span of 1 is assumed. The total number of columns spanned by all the labels on each header row for a given axis should be the same. The content of a <tablemodel:cell> element describes the content of a single data cell. It consists of a sequence of zero or more <tablemodel:fact> elements. Each of these contains the URI of a fact which is in the cell. The URI will consist of an instance document location with an XPointer to the fact within the document. A <tablemodel:cells> element may only be empty if it is the outermost (and only) element for the enclosing table. This indicates that the table contains no cells. Otherwise, it MUST contain either a child <tablemodel:cells> element or a non-empty sequence of <tablemodel:cell> elements. Note also that the nesting of <tablemodel:cells> elements is restricted to defining the axes in a fixed order (z, y, x). A single table definition can define multiple tables in a table set in the structural model, according to the values its parameters can take, as described in Section 5.3. The parent of S is the structural node to which the parent of D resolves. The children of S are the roll-up R and the resolved children of D.
The parent of S is the structural node to which the parent of D resolves. If D has no parent, S has no parent. The non-root structural nodes in the result are arranged as described in the specification of the definition node. The parent of the resolved children S1..Sn is the structural node to which the parent of D resolves. If D has no parent S1..Sn have no parent. Despite representing a number of aspect values, and ultimately a number of columns or rows in the rendered output, open definition nodes resolve to one open structural node since they depend on a fact source (typically an instance). The resulting open structural node represents a part of the table which is dynamic. The facts of a table are from the fact source which MAY be an XBRL instance (data presentation), or MAY be virtual allowing new facts created from information entered into a tool by a user to produce a new or edited output XBRL instance (data entry). In the latter case, the table provides a description of the facts that may be entered. The non-participation of a dimensional aspect implicitly constrains the facts in the table to those which do have no aspect value for that aspect or have the default aspect value for that aspect. The non-participation of non-dimensional aspects leaves the cells in the table to be unconstrained with respect to those aspects. Multiple breakdowns may be associated with a single table axis. Breakdowns on an axis are ordered according to the @order attributes of the table-breakdown relationships linking their definitions to that of the table. The effective breakdown for a single breakdown is the breakdown itself. The effective breakdown for a pair of breakdowns is the tree formed by attaching an identical copy of the second breakdown to each leaf of the first breakdown, such that the root nodes of the second breakdown become the children of the leaves of the first breakdown, as illustrated in Figure 16. The projection in Figure 17 involves a more complex breakdown, that includes two roll-ups (B requires padding with an additional roll-up node to bring the first breakdown tree to a uniform depth (see Section 5.4), thus ensuring that the individual breakdowns line up correctly in the effective breakdown. As part of the layout process, headers are constructed for each axis of the table. Axis headers are produced after projecting the breakdowns in the structural model onto axes, as described in Section 9.3.2. Elimination is the process of eliminating unpopulated slices (e.g. rows and columns) to produce a more compact table. An unpopulated slice is a slice of a table is one whose constraints match no facts when populating the table. Processors MUST be able to produce a complete table in which no slices have been eliminated. Processors MAY eliminate some or all unpopulated slices. The conformance suite for this specification expects output tables to have no slices eliminated. Processors MUST NOT perform elimination when laying out a table for data entry. Expansion is the process of expanding an open structural node during the layout process. This expansion depends on the fact source. Aspects that participate in expansion are referred to as expansion aspects. An open structural node contributes one layout node for each value of each expansion aspect it defines. Every open definition node defines the expansion aspects of its corresponding structural node. See Section 6.8.2 for a description of expansion for aspect nodes (the only open nodes defined by this specification). These facts MUST be arranged in the table according to the constraints associated with its slices (e.g. the columns, rows and positions along the z-axis). Closed tables have a fixed shape in that they do not depend on facts in a fact source, so the initial layout process for data entry is the same as for data presentation of an empty fact source when performing no elimination. Open tables have a shape that depends on the fact source. For data entry, the facts in the fact source can change (and it will often be empty initially). Processing software that supports data entry MUST allow the user to dynamically add aspect values for any expansion aspects. These aspect values MUST be validated against the constraints defined by the open definition nodes. For example, if an open definition node defines period as an expansion aspect, but defines no constraint, the user should be able to create new columns for any period. If an open definition node defines a typed dimension as a expansion aspect, constraining values to a be numeric, the user should be able to create new columns for that dimension and the user should either be prevented from entering non-numeric values or any non-numeric value entered should cause a validation error after entry. The Publication URL for this schema is http://www.xbrl.org/PWD/2017-07-12/table-1.1.xsd. The Publication URL for this schema is http://www.xbrl.org/PWD/2017-07-12/tablemodel-1.1.xsd. XBRL International Inc.. "XBRL Formula 1.0"
Table Linkbase 1.1 draft created based on 1.0 Recommendation. Updated aspect-balancing rule to exclude the unit aspect, allowing items with and without units to be used on the same axis. Improvements to layout model serialisation designed to make it easier for vendors to run the conformance suite. Fixed erroneous references to "label" (singular) in Section 5.5.4. Clarification of the term "preferredLabel attribute" to include both standard and generic preferred label attributes. Removed constraintSetAspectMismatch error. This means missingAspectValue now covers the difference between constraint sets and means the specification is no longer arbitrarily stricter about constraint sets differing by dimensional aspects (which can always be inferred as absent/defaulted). Added section on Table Regions. Clarified Table Region cell selection; added examples and control over regions' selection of roll-ups. Added an error when both preferred label and generic preferred label are used on a presentation arc encountered during concept relationship node expansion. Initial Public Working Draft of Table Linkbase 1.1. This appendix contains a list of the errata corrections that have been incorporated into this document. This represents all those errata corrections that have been approved by the XBRL International Rendering Working Group up to and including 12 July 2017.